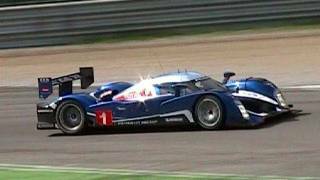 Peugeot celebrated fifth win of the season with Stéphane Sarrazin and Franck Montagny in Peugeot 908 HDi FAP 2010 at the Intercontinental Le Mans Cup. Check out Le Mans racing car pictures after the jump. 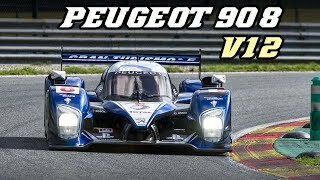 Team Peugeot Total produced a blend of panache and suspense to round off the Peugeot 908 HDi FAP's remarkable career with a resounding victory in Sunday's 1000km of Zhuhai (southeast China). It was a perfect performance from the team monopolising the front row of the grid and then taking a well deserved win. This fifth win of the season thanks to Stéphane Sarrazin and Franck Montagny in the N°2 Peugeot 908 HDi FAP, secured both the Teams’ and Manufacturers' title in the inaugural ILMC (Intercontinental Le Mans Cup)! 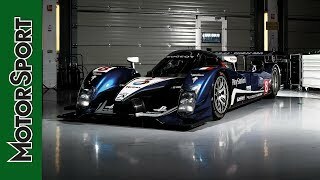 In a little less than two months, Peugeot has succeeded in dominating the ILMC by winning every round, including two, one-two finishes (Silverstone and Road Atlanta), to claim both the Manufacturers' and Teams' crowns in the newly created ILMC. 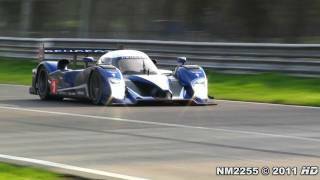 The race win went to Stéphane Sarrazin and Franck Montagny in the N°2 Peugeot 908 HDi FAP which crossed the line with a cushion of 4.826 s over the Audi of Kristensen and McNish. The other Peugeot 908, shared by Sébastien Bourdais and Simon Pagenaud, finished fourth after losing time and track position due to a collision with another competitor within sight of the finishing flag. Peugeot's main opponent, Audi, did all it could to apply pressure during the opening laps, and Capello (Audi N°8) briefly succeeded in splitting the two French cars before the Peugeot’s began to pull clear after the first round of refuelling stops. The final phase of the 1000km of Zhuhaï however, proved to be an emotional roller-coaster for all the front-runners. Throwing all he had had into the fight, Franck Montagny lost a little ground after going wide into a gravel trap on Lap 162. Shortly afterwards, Bourdais was forced to make an unscheduled pit stop to change a number of damaged body parts following a collision with a slower car, dropping him down the order and earning him a one-second "stop&go" penalty. This left everything poised for the outcome to be settled by the speed of the last refuelling stop of the No2 Peugeot driven by Stéphane Sarrazin who had retaken the lead when Kristensen (Audi) made his final stop. Peugeot Sport got its calculations spot on, calling the Frenchman in for a "splash and dash" on Lap 219 which enabled him to rejoin the race in front of his Danish rival! 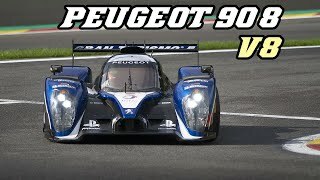 From then on it was a race to the flag and a well deserved 19th win for the Peugeot 908 HDi FAP which has ended its career on the top step of the podium. After completing the 232 laps in 5hours 36minutes, Team Peugeot Total and its drivers could let their joy show after the incredible tension of the previous two hours or so. Sarrazin (Peugeot N°2) took the chequered flag with a lead of 4.826s over the best-placed Audi, a result which clinches both the Manufacturers' and Teams' titles in the inaugural Intercontinental Le Mans Cup for Team Peugeot Total. Stéphane Sarrazin: "It was an extremely close race, and the last 20 or so laps were incredibly difficult. I just tried to stay concentrated all the way to the flag and not make any mistakes while at the same time driving absolutely flat out. The team did an amazing job and I am proud to have celebrated the 908's last competitive outing by qualifying on pole position and winning the race here in China." Bruno Famin (Technical Director, Peugeot Sport): "The 908 has concluded its career the way it began it: with a win! True, today's success was a very close-run thing, but I think that only serves to underline how difficult our mission was today, and that makes it all the more satisfying! The race scenario was quite strange, because we started strongly before suffering one or two technical and sporting setbacks. Our biggest technical issue concerned the brakes of the N°2 Peugeot which tended to wear very quickly. As a result, we asked Stéphane to modify his driving style and he had to live with the problem until the very last turn…"
Olivier Quesnel (Director, Peugeot Sport): "We are naturally delighted to have won the inaugural ILMC title, but today's win is particularly satisfying. The race was quite simply magnificent, and the fact that it enabled the 908 to complete its career on a high note is magical. The car will now take its place as one of motor racing's legendary cars, and I am especially proud to have taken this win in China which is a market where Peugeot has high ambitions." Franck Montagny: "What an incredible way to end a race! I have to say that I share my car with a fantastic driver! At the beginning of my first stint our car was really strong. But then its performance started to deteriorate, especially concerning its balance under braking."